Okay, its not my favorite Land Cruiser either, for looks or for the fact that in the US you can’t get one thats not fluffed up like the huggie bear on rogaine but its still a Land Cruiser and that name carries with it a certain weight. I’ll spare you the history of the Land Cruiser except to say that the Land Cruiser name today is more than it was in the iconic FJ40 era. Around the 1970’s the Land Cruiser family tree branched out and several offspring were birthed from the hearty root of the original BJ (“B” engine Jeep) and included the heavy duty line, called the 70 series, which is badass and kicking to this day, the light duty line called “Prado” and the J wagons, including the us market 60/62, 80, 100 and now 200 series. Around the time of the 80 series, considered by some to be the best vehicle Toyota ever made, Toyota began to notice that the people who bought Land Cruisers weren’t rough and tumble types (does that mean they like to roll around in rocks? I don’t know) but were more likely dentists, surgeons, basketball players and so on. These people had 60 series Land Cruisers and loved them, but were starting to demand things like comfort, speed, convenience etc. As such the basic and simple FJ80 of the early 90’s with one foot firmly in the outback and reeking of that Land Cruiser charm slowly morphed into a vehicle that could only be had with leather, power everything, speakers galore with CD changer (!) and generally anything else Toyota could think to stuff in to keep those well heeled customers happy and sales were good. Ever since then the Land Cruiser J wagon in the US has been on an ever pampering, cosseting trajectory and in 2008 a new model, the J200, was born. Even still, in chasing the money of the well-to-do US buyer by adding luxury the J wagon still retained its authentic roots; After all even though the US market isn’t in a mood to explore, its still sold in many countries that are, whether you want or even need to and you count on the legendary toughness of what is affectionately called the “bush taxi”. The 100 series, for example, even in US spec is often cited as the best used overland vehicle you can buy. The 200 is much the same story, with rugged and bare bones version being used all around in the world in places and in roles where luxury is defined as getting there...and back. But as you can guess, this isn’t the version we we get in the US, not even close. Toyota, in its infinite wisdom, has decided that Americans only want a fully dressed 200 and so that’s what we get. Its 80 grand+ and although that sounds like a lot of money, as your resident Land Cruiser nuttist, I’m here to try and explain where all that money goes. 1. 2.5% import tariff (built in Japan and imported). Any passenger vehicle imported from Japan (and other places as well) is subject to a 2.5% import tariff. All Land Cruisers are built in a plant in Japan and shipped overseas. This is the kind of plant that they fire you if you can’t demonstrate high levels of dexterity and worker competence. 2. It starts at 80 grand...and ends there; It has no options and comes fully loaded. Full underbody armor package, KDSS, rated recovery hooks, beefy ball joints, control arms, bump stops, bushings and shocks. 4. Built with parts unique to the land cruiser that are designed for 25 year service life. All Land Cruisers are built around the concept of a 25 year service life and that means more expensive and durable components. For example, the windshield is 2mm thicker than standard Toyota and the entire exhaust is stainless steel and double thick for corrosion protection and no warping/cracking when you dunk it in water hot. 5. Its a low volume niche model. a. Wealthy - They don’t mind dropping 80 grand cash on a car, in fact, if it were less money...they might begin to wonder if its lost the luxury goods air. B. Brand loyal - They will be back to buy a Lexus RX for their spouse, a Corolla for their daughter and a 4Runner for their son. Contrary to popular opinion, most people in this crowd don’t care if its not up to the minute design or stacked with the latest features. 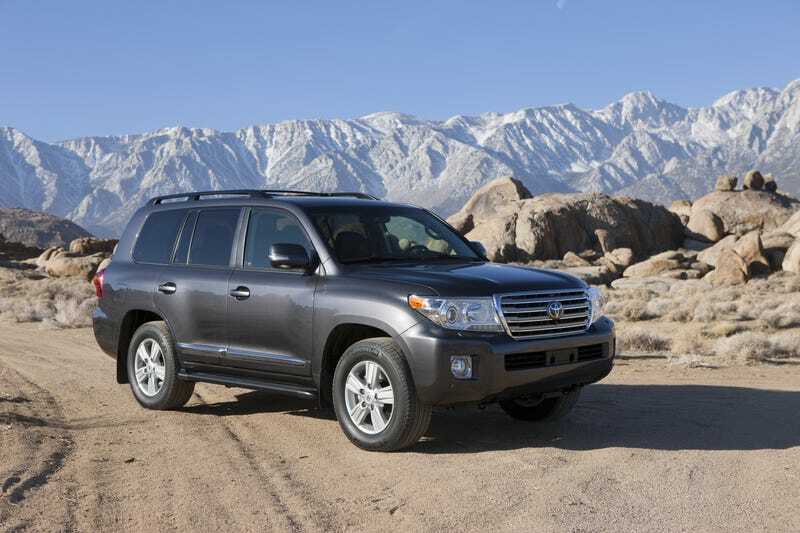 Most US Land Cruiser buyers want: QDR - Quality, Dependability, Reliability. It also has to be super safe and hold its value. All things the Land Cruiser does better than just about anything else you can buy. Is it dated? yeah...no one who buys one cares. 6. Minimal commonality with other vehicles. 7. They’ve earned their reputation that “luxury” can still mean insanely well made cars. People used to think that a car built to a higher standard was worth paying extra for, but not now I guess? In any case, the Land Cruiser has 100% earned that reputation of being a long lasting, well built vehicle. I think its telling that all the explorers I know that have been doing it a long time either bought a Land Cruiser early on and stayed, or switched from Land/Range Rover to a Land Cruiser. A Land Rover is a wonderful thing, but even the Land Rover faithful will attest to the fact that the Cruiser is the more reliable choice. Just check out this score from the Trade In Quality Index which is a survey of actual cars at trade in and not some “initial quality” nonsense. So yes, 80 large is a lot for a Toyota but shop around in the Ford camp, or in Chevy town and you can get their large SUV’s up into the low to mid 70’s and that’s without the import tariff, or the additional off road hardware, or extended lifetime hardening, etc. If I had to sum it up into a formula I would say its 95% because its expensive to make, 5% because they can. The truth of the matter is that the Land Cruiser just isn’t for everyone, it never has been and never will be. For those that know, its not a rip, its money well spent.